Image caption Jermaine Jackson: "We're living in a time where people can say anything and it's taken as truth." 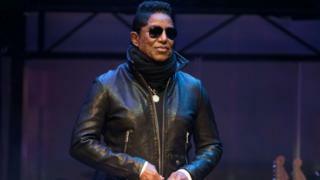 Jermaine Jackson has said there is "no truth" to allegations in a controversial new documentary about his brother Michael. In Leaving Neverland, James Safechuck and Wade Robson claim they were abused by the singer as children. Jermaine told ITV's Good Morning Britain: "Michael was tried by a jury of his peers and he was acquitted." The four-hour documentary premiered at the Sundance Film Festival last week and was seen to be so shocking that audiences were offered emotional support in the interval. Mr Robson and Mr Safechuck were aged seven and 10 when the singer befriended them and their families. Mr Robson said under oath in 2005 that the pop star never abused him, but has now rowed back on this. Jackson's estate has previously condemned the film, saying it is "an outrageous and pathetic attempt to exploit and cash in" on the singer, who died in 2009 at the age of 50. The film's director Dan Reed defended the documentary, saying he believed what the men were alleging in the film. "Neither Wade, James or any members of their families were paid for their participation in the film, directly or indirectly," he told Rolling Stone. "This is not a story about Michael Jackson. It's a story about child sexual abuse that happened to two families whose lives intersected with Jackson. The fact that the abuser is Michael Jackson gives the film a reach and a relevance that I welcome." Jermaine Jackson maintained Michael's innocence during his interview on Wednesday. "We're living in a time where people can say anything and it's taken as truth. "Under oath he [Mr Robson] said what he said, they would rather believe a documentary than looking at what was said under oath, under a judge, jury, everything."